On 24 April, 2013, the factory building of Rana Plaza collapsed with a death toll of 1,129 lives and injury of approximately 2,051 workers. 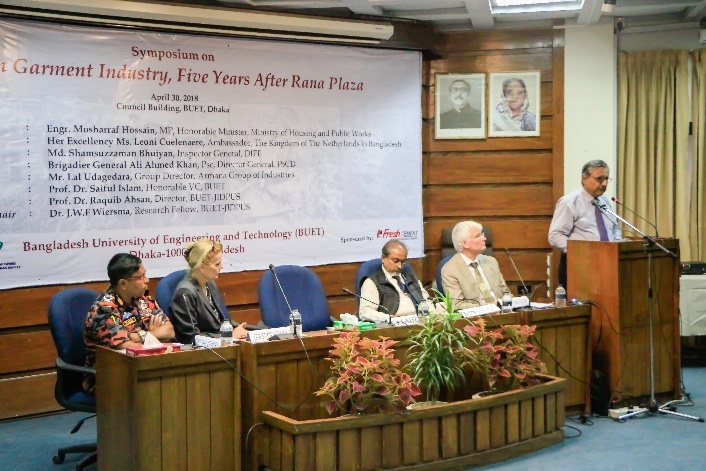 In the completion of five years after the deadly collapse, BUET-JIDPUS in association with BNUS conducted a day-long symposium on ``Safety in the Garment Industry, Five Years after Rana Plaza" on 30 April, 2018. The ceremony commenced at the Council Building, Bangladesh University of Engineering and Technology (BUET). The symposium was presided by Prof. Dr. Saiful Islam, Honorable Vice Chancellor, Bangladesh University of Engineering and Technology. Her Excellency, Leoni Cuelenaere, Ambassador of The Kingdom of Netherlands to Bangladesh was present to grace the ceremony as Guest of Honor. Md. Shamsuzzaman Bhuiyan, Inspector General, Department for Inspection of Factories and Establishments (DIFE) and Brigadier General Ali Ahmed Khan, Director General, Fire Service and Civil Defence (FSCD) were present as the Special Guests. 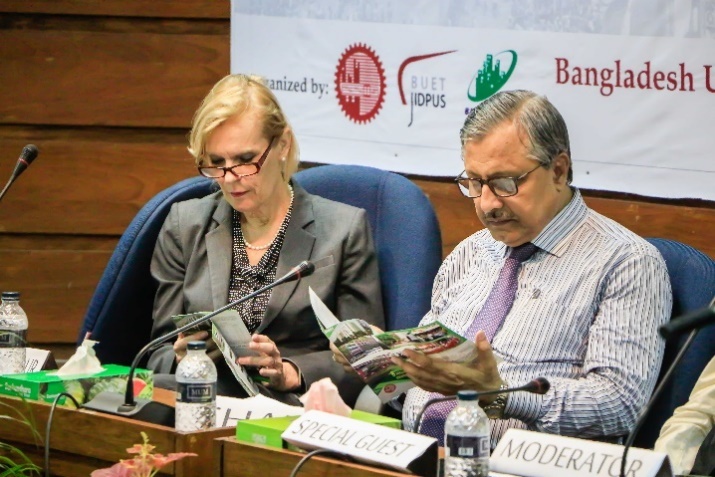 Professor Dr. Mehedi Ahmed Ansary, Director, BNUS; Professor Dr. Raquib Ahsan, Director, BUET-JIDPUS, Chair of Symposium and Dr. J.W.F Wiersma, Research Fellow, BUET-JIDPUS, Co-Chair of the Symposium attended the ceremony. 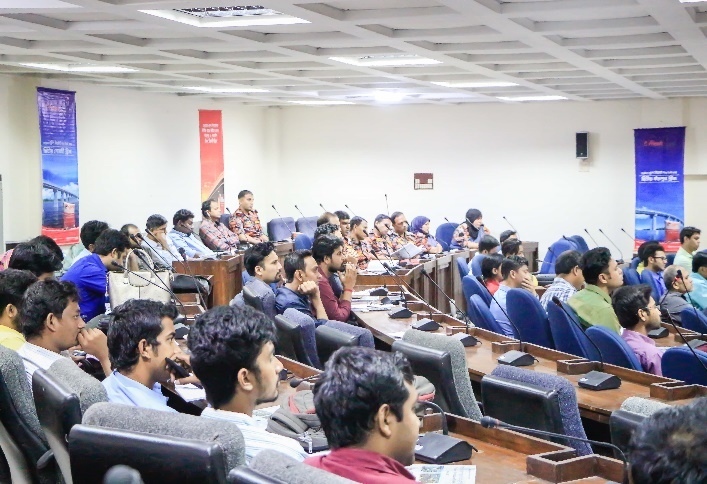 The symposium was also attended by faculty members of various departments of BUET, including BUET-JIDPUS, Electrical and Electronics Engineering (EEE), Mechanical Engineering (ME), Petroleum and Mineral Resources Engineering (PMRE) and Urban and Regional Planning (URP). The symposium offered an opportunity to share and discuss ideas and experiences on different aspects of safety management in Ready-Made Garments (RMG) sector of Bangladesh. Twelve papers related to structural safety, electrical safety, fire safety, gender and policy issues of RMG sector were presented and discussed in the symposium. Authors from reputed research institutes, international organizations and faculties of BUET were invited to submit and present their paper. 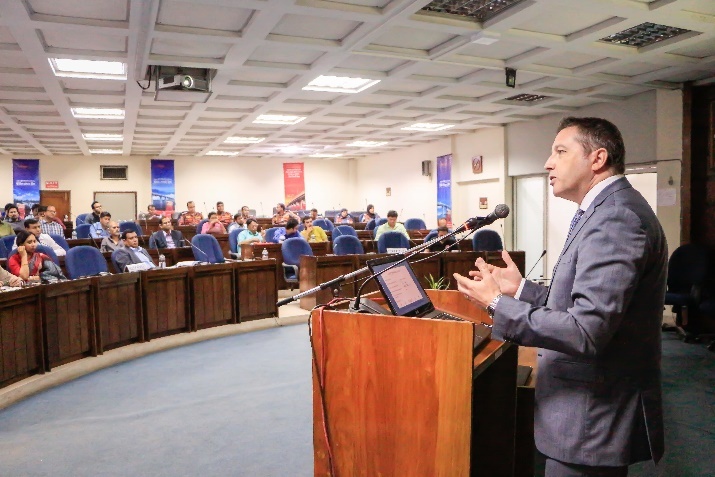 The programme was arranged into two different sessions. The first session contained six papers focusing on the institutional and policy aspects of safety, fire safety and boiler safety scenario of Bangladesh. Seven papers were presented in the second session with main focus on the technical issues, including in-situ concrete strength, electrical safety guidelines and computer modelling of fire safety.